Sisters of Science is the first general introduction in the Finnish language to the early history of women and learning. 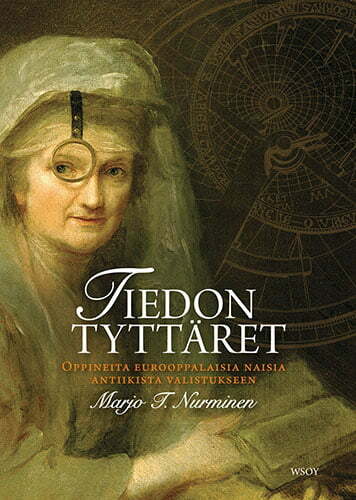 The book, beautifully illustrated and based on thorough research, opens new and exciting vistas to the many thousands of years of European science, bringing to life the forgotten women of science. How have knowledge, power, and gender been linked to each other in various eras? Were there women philosophers in the time of antiquity? Why were women not allowed to study at universities? How was it possible that a in the early 17th century, a young girl knew more about insects than all the men at the university? Sisters of Science provides the answers to these and many other questions. Throughout millennia, women have been blocked from entering the world of learning and science, but still many of them managed to gain knowledge from various fields. The heroines of the book – independent women of science, irreplaceable assistants, explorers, patrons, and non-fiction writers – are seen within the framework of their own cultural-historical context, allowing us to comprehend how they fit in in the larger picture of advancing history. The book explores the destinies of 26 women, taking its readers on a journey through time that helps us understand why so few women have reached the top positions in science. The list of characters, attached to the end of the book, introduces us briefly to more than one hundred learned women from over three millennia, from ancient Egypt to the closing of the 18th century. The book has been translated into Chinese and Japanese. The Complex Chinese version of “SISTERS OF SCIENCE” has been listed as Best 10 of Historical Publications of 2015 by “Speaking of Book”, a young and new book reviews platform/ Media in our local market. The author places the Intellectual women in the context of history, deeply describe the life of these female scientists and external pressures they had to face when studying science or doing their research. This title offers the possibility of writing “her-story” outside the domain of “history” which focus on men.